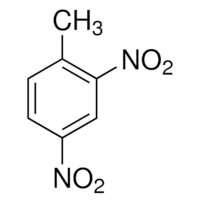 2,4 Dinitrotoluene (2,4 DNT) is used for the production of explosives, for which it is a gelatinizing and waterproofing agent. 2,4 Dinitrotoluene (2,4 DNT) is used as a plasticizer, deterrent coating, and burn rate modifier in propellants (e.g., smokeless gunpowders). 2,4 Dinitrotoluene (2,4 DNT) is used as an intermediate in dye processes. Appearance Light Pale Yellow Crystalline powder. Solubility Freely soluble in acetone and benzene.